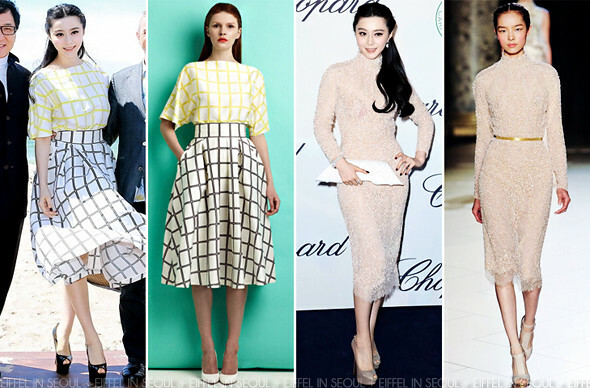 Stylist Christopher Bu (卜柯文) had the fortune of having his client, Fan Bing Bing (范冰冰) wear one of his checkered ensemble from his latest Chris by Christopher Bu Spring/Summer 2013 collection at 'Skiptrace' press conference held during the 66th Cannes Film Festival on May 17, 2013. The beautiful actress had her Marilyn Monroe moment when her skirt was caught by the wind. Fan Bing Bing (范冰冰) opted for a pair of Giuseppe Zanotti pumps to go with the dress. She also made an appearance at Chopard lunch wearing a back-less embellished long-sleeved dress from Elie Saab Fall 2012 Haute Couture collection on the same day. Chopard jewels, Bracher Emden clutch and Sergio Rossi pumps to accessorize her look. Loathe the red bra she wore. Please excuse the influx of updates and posts from the 66th Cannes Film Festival. I hope you are enjoying the festival as much as I do.